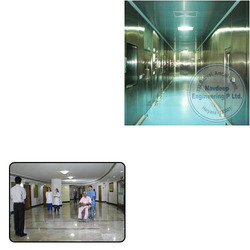 We are the leading manufacturer and service-provider of Clean Room Partition Panels for Hospitals. These partitions are used in rooms where concentration of air born particles needs to be controlled. We are the leading manufacturer and service-provider of Clean Room Partition Panels for Hospitals. That has a low level of environmental pollutants such as dust, airborne microbes, aerosol particles and chemical vapors. Looking for Clean Room Partition Panels for Hospitals ?